The acoustic ceiling treatment (aka popcorn) is completely removed, and now we are starting to prepare the rooms for their normal lives. This is the sewing room, with plastic still everywhere, but at least the ceiling fan is installed. The two tables you see are actually one table and one countertop, both of butcher block from our first house over 30 years ago that I've carried around with me for three moves. The actual contents of the sewing room are stacked all nice and neat albeit inaccessible, in the dining room downstairs. The backpack on the chair belongs to my son, who is visiting for a couple weeks. But wait! There's more! I have two large plastic roll around four drawer bins, four smaller three drawer roll around bins, four large plastic tubs, four small three drawer shelf units, three under bed storage bins, and at least four medium tubs, all crammed full of fabric, threads, tools, and other necessary stuff. Where do I put all of that and how in the world do I organize it so I can find what I need, when I need it? I first posted about organizing the sewing room over two years ago in this post. Now I'm actually going about it. So the big question is, how do I organize all the stuff that needs to go back in there? I'm taking this very methodically. I am an engineering manager in a large US defense firm, so there is a certain way we go about things, which is very adaptable to this situation. First of all, list the requirements, then match budget to requirements. If the budget isn't enough to cover all the requirements (and it never is), then modify requirements to fit the budget. What are the possible solutions to the requirements? For example: Requirement - thread storage; but how? in bags by numbers? on peg board? in drawers by color? All of the possible solutions need to be considered to come to an affordable and workable answer. Then there are the make/buy decisions. What can I do myself, and what do I need to contract out? Obviously, I can paint, but can I install closet doors (uh, no), and how about the closet system? (definitely, yes, more on that in another post). After these decisions are made, it's time to get to specifics such as how to place existing furniture, assuming it meets the storage requirements, and what other modifications to make to the room to make it a functional and pleasant sewing room. This is a big requirement - it needs to be a place I really want to be in most of the time. Well, being a sewing room, it already satisfies about 90% of that requirement, but I do want to add some fun touches. Mind you, I have literally no imagination along those lines, but, I have a new source of inspiration. I'm now on Pinterest. I am looking for organization ideas that I think will apply to sewing/craft rooms and posting photos on my board, Sewing Room Ideas. Pretty clever name, don't you think? So far, I have a total of four or five photos, but as I search, I'm sure to get more. If any of you have some great ideas, please let me know. I need all the help I can get. I don't know how to put the Pinterest button on my blog, but will find out how eventually. Enough jabbering for now. As you no doubt can tell, I plan on taking this whole reorganization thing fairly methodically. I also plan on sharing with all of you the process I will use to arrive at the final design. As I search on the Internet I find photos of finished rooms, but not the thought process that went into them, which I find frustrating. Maybe my agonizing over decisions will help those of you who are trying to figure out how to organize the huge quantities of fabric, threads, needles, and all the other stuff that we tend to accumulate. I've managed to stitch a bit more on the Christmas wall hanging I'm making for my mother's door. It's not much, considering that it's been almost a month since I last posted on it. I get a bit done here and there while it's my carpooler's turn to drive. This past week the sun is right in my eyes both during morning and evening commutes, so I got even less done. I'm also helping with the painting of my sewing room and my son's room. He is due to arrive home on Wednesday for a couple of weeks of R&R, so this really needs to get done. 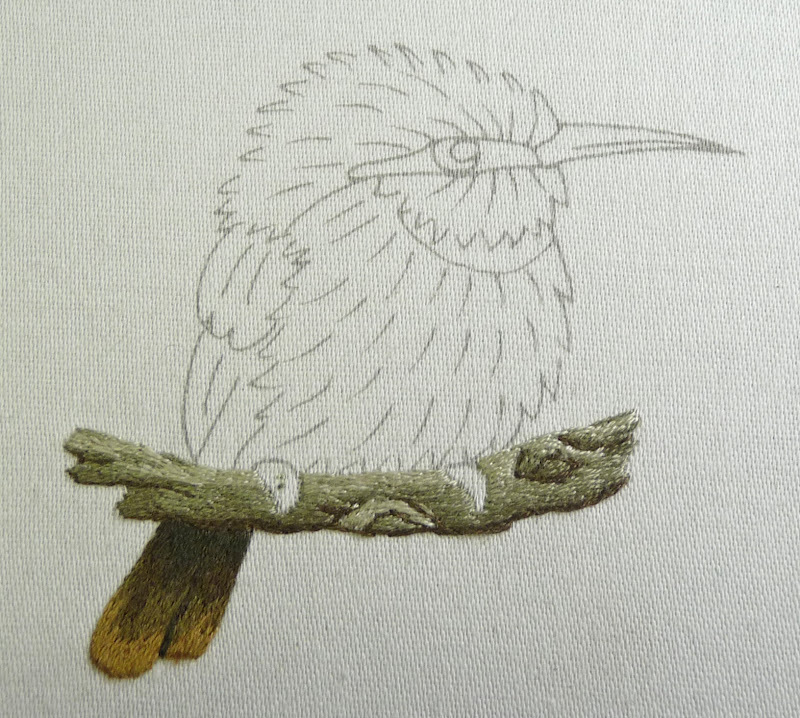 There is a bit of weekend left, so I hope to get a few hours in on my Little Bee Eater. I've successfully passed Lesson 1, and am working on Lesson 2, the branch. I've also lost the middle shade of red, DMC 3830, so it's off to Joann's for a replacement skein. I've gone and done it. I've started two new projects when I have absolutely no business doing so. But sometimes, I just can't help myself. Have you heard that excuse before? In this case, an expert embroidery teacher was scheduled to teach some classes in Portland, Oregon, and our local guilds decided to have her come teach a few classes here in Southern California and save a bit on air fare. This is Drawn Thread Embroidery Accessories Set by Barbara Meger. Beautiful, aren't they? If you click on her name you will be taken to her classes page and can see all that she has to offer. Our kit contained enough materials to make three of the four items shows, so of course I bought an extra. The fabric is 32 count Belfast Linen, just lovely to hold and to sew. We are using DMC Perlé No. 12 in Blanc with No. 24 tapestry needles. Nice and blunt, no pricking or bleeding with this project. And it's easy to pull the threads, and you can actually see them! Not like working with handkerchief linen or cotton batiste, which I've done before. The linen in lined with blue silk dupioni so the blue shows through the holes caused by the withdrawn threads. I traded in my blue for rose, as I have a lot of rose silk and may make other things that may just sort of match. I did try very hard to make the little pincushion come out white, but wasn't very successful. You can see the blue a bit better with the box cover. The side of the box. Isn't it beautiful? The box is hand made in Suffolk, Virginia of maple from the Suffolk Shaker Shop. The little nails on the tongues are copper. This is as far as I got. That is chain stitching at the top, and I need to add another row. Below the chain stitch is herringbone stitch, and below that is cable stitch, just like in smocking. We withdrew two threads for that, so the stitching gives it an open feeling. The next one is a stitch that Barbara found in an Italian magazine and she didn't know the name, so she calls it Van Dyke as it does somewhat look like the Van Dyke stitch in smocking. The big area at the bottom is Italian Hemstitch, worked over a gap of 10 withdrawn threads and into another little channel of one withdrawn thread three threads up. The little bundles are three threads each. As you can probably tell, another row needs to be worked on the bottom. Then I have to repeat the top five rows below the Italian Hemstitch in a mirror image. Oh, and this is just one-third of the linen. I worked the Italian Hemstitch down one side of the 24 inch piece. There's a lot left to do! This was Friday's class sponsored by the Long Beach Embroiderer's Guild of America. I took another on Saturday, but that's a subject for another post. There is also a smocking class going on today, which I decided to skip. I plan on spending an hour or two out in the heat on the patio stitching this afternoon. It's been over 100 °F for the past two days, but is much cooler, only high 80's today. This is still quite a bit over the average for September and I am really looking forward to some cooler weather. The ceiling scraping is finished, but there is lots of painting and other work to do before the house gets back to normal. Thank you to Monica from Lakeview Stitching. I was wondering if I should pack up the Chinese Birds and Flowers project and switch to this one in the sit-upon hoop. 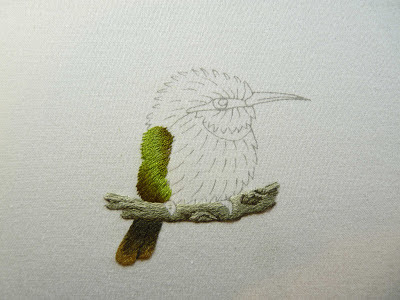 Monica was very definitely in favor of doing so, and because of her encouragement, I have made a start on the Little Bee Eater, an online class taught by Trish Burr of Cape Town, South Africa. In this photo, most of the tail feathers were completed before I remembered to take a picture. The completed tail feathers. I've made a start on the branch, and will post photos soon. Needle painting is fun, but I find that I really have to watch what I am doing all the time. I thought I would listen to books on tape, but that isn't working out at all. I need to concentrate on getting the shading right, and the book I'm listening to, The Peloponnesian War by Donald Kagan, doesn't allow me to concentrate much on anything else. While not quite exactly a history book, it is distilled for the non-historian from his academic work on the same subject, but still takes a great deal of effort to understand what is going on. I simply can't get all those Greek names straight. 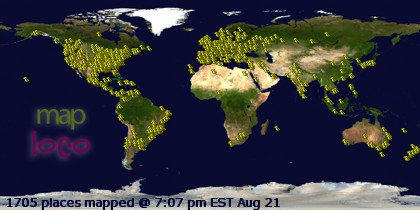 My house is still in an uproar from the popcorn scraping. I still don't have any hallway lights, but I did have the presence of mind to plug in a stand Ott-lite into the power strip that somehow peeks from behind boxes in the study where we have the computer. So at least I can get in here in the dark and get on the computer without stubbing toes or falling in the dark. Soon it will be done! When I last left you with this project, I was having some trouble getting the shading right on the flower. I spent some serious time on it this weekend, and finished the upper left flower. but I did manage to lighten up the two bottom flowers. Now it's on to the leaves on the lower right hand flower. After searching Trish's kits for a while and following a suggestion from Carol Anne in the UK, I finally decided that this flower is a plumeria, at least that is what we call it here in the US. 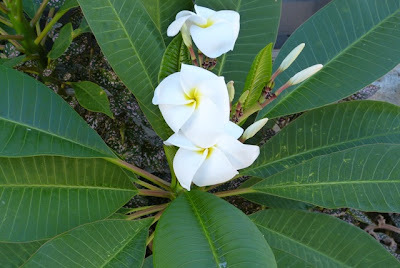 In much of the rest of the world it's known as frangipani. I actually planted two of them two years ago, and now one is blooming. The other one I planted is red and is due to bloom soon. I know it's late in the year for blooming, but I just haven't fed them as I should. The fragrance is just heavenly, and I should see the red one blooming in a week or so. I did buy some special blooming fertilizer and have been giving them regular feedings to boost next year's blooms, so I'll keep my fingers crossed for a better blooming period next summer. The removal of the popcorn on the ceilings is finished, but the new texture is being applied this week and next. What a mess! Everything in the house is coated with a fine film of dust. I cover the embroidery and hide it in my closet with the door closed, so it escapes the worst of it. I have no lights in the hallway near the study, and there are so many boxes in here I can't reach the one lamp, making me writing this by the glow of the computer screen. After all this is finished, then we start painting. I can't wait to get my sewing room back. I hope you are all enjoying nice fall weather without hurricanes. The daytime temperatures are still in the high 80's to low 90's, but the lows are getting lower and it's deliciously cool in the mornings. It's now September, and I have a dilemma. 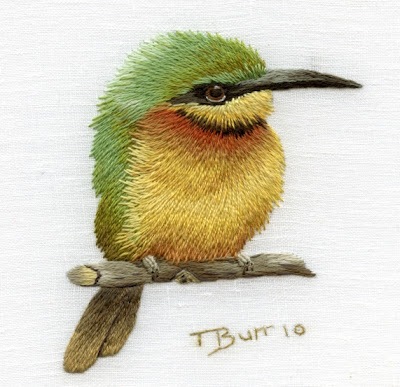 My online class with Trish Burr on the Little Bee Eater has started, and there is now way I can finish this current bird in the next week or so. To top it off, I packed away my other sit-upon hoop, so do I pack away the current project in favor of the Little Bee Eater, or finish it and start the Bee Eater later? I don't know how long Trish will allow the class to run, I'll look it up sometime when I can see what I'm doing in the study. To close, I'll post this reference to Piece O' Cake blog. It's about cats, and if you're a cat lover, you will appreciate Henri. I've watched it several times and still laugh out loud at it.